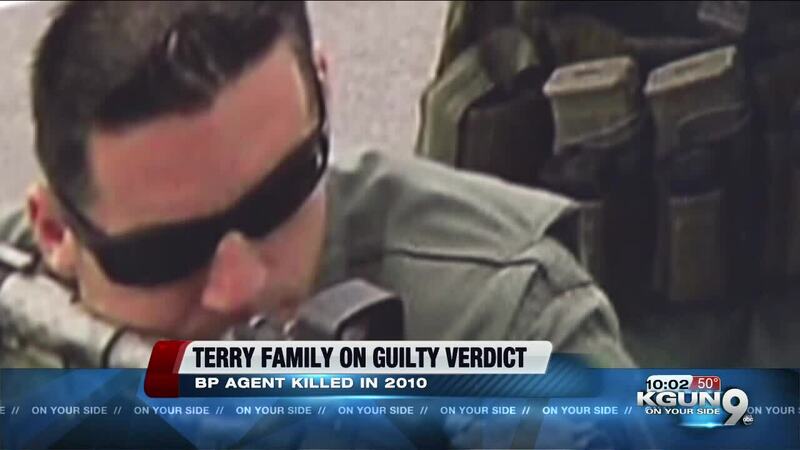 TUCSON, Ariz. - A sixth suspect in the murder of Border Patrol Agent Brian Terry was found guilty on Tuesday. KGUN9 spoke with his sister after the latest in a series of guilty verdicts for the men involved. Being in Tucson for Terry's family is bittersweet. "It's almost like you're visiting him but you're not," Kelly Terry Willis said. "But when you're visiting the Border Patrol family and seeing where he got to live, that kind of shows us a little bit of warmth." Terry Willis says the past nine years have been an up and down journey for the family. The trial for the sixth suspect in her brother's 2010 murder started last Wednesday. She says it was emotionally taxing -- and heartbreaking -- to hear the story of how Agent Terry's team tried to save him. "We actually felt more emotion for them because they were there that night," Terry Willis said. "We've already seen Brian smile and they saw him take his last breath. So our hearts were more with them this trial, because we know they had relived that fateful night all over again." But as the guilty verdict was reached for Heraclio Osario Arellanes -- convicted of felony murder on all counts -- Terry Willis says the family felt a wash of relief, of being one step closer to closure. "We just put our faith into the justice system for keeping Brian's faith alive. And not resting until they caught all of them. I didn't think it would be eight years later at the time." As the family prepares to leave Tucson after spending a week in town, Terry Willis says they're looking forward to the trial of the final suspect. Jesus Rosario Favela-Astorga has been arrested but not extradited to the U.S. The Terry family's hoping to move forward, almost a decade after the ambush in the desert. "It's been a long journey, we still have one more to go for Brian's justice. And we just hope that once the final defendant is in court and found guilty, as well, then I think we'll be able to have a little bit of closure for ourselves."